Keynote Address Women of Walmart: Pay Less. Live Worse. Hilary J. Gettman, J.D., Ph.D.
Dr. Hilary Gettman will explore the causes and consequences of the class action lawsuit against Walmart. Her talk will highlight the research findings on propensity to negotiate, the gender pay gap, sexual harassment, and discrimination. Dr. Gettman is a graduate of Harvard Law School and received her Ph.D. in Organizational Psychology from the University of Maryland. She is an Assistant Professor of Management at Stonehill College and an Executive Fellow at the Smith School of Business at the University of Maryland, College Park. Dr. Gettman practiced securities law in the private sector for over five years before deciding to change careers and move in the direction of organizational psychology and leadership development. Dr. Gettman has extensive training and both consulting and academic/research experience in managerial/leadership assessment and development, executive coaching, motivation, and behavior change. **New time – switched with Nomin B. 10:50 | Sara M. Caudle (Dr. Alice Kassens): Are healthier college students the most productive? 4:05 | Stephanie I. Vogel (Dr. DorothyBelle Poli & Dr. Alton Dooley, Jr.): Effects of fire on Lycopodium: A good witch or bad witch? 4:25 | Brandi L. Neifert (Dr. Alton C. Dooley, Jr. & Dr. DorothyBelle Poli): A comparison of tooth breakage rates in Miocene carcharhinid sharks from the Carmel Church Quarry, Caroline County, VA.
14. Daniel J. Waters (Dr. Rachel Collins): Do invasive species facilitate other invasive species? 18. Kacy L Dillon & Steven L Huffman (Dr. Denise Adkins): What Predicts Whether College Students Will View Their Professors Positively or Negatively? 20. Chava Z. Urecki, Kiel L. VanNess, Brooks K. Hoover, Michael J. Bankert (Dr. Christopher T. Buchholz & Dr. Gordon Marsh): The complexity of melancholy: Music preference and the perception of music. 35. Casey R. Wojtera (Dr. Tim Johann): Activity Variation from Codon Mutation at Position 123 in 5,10-Methenyltetrahydrofolate Synthetase. 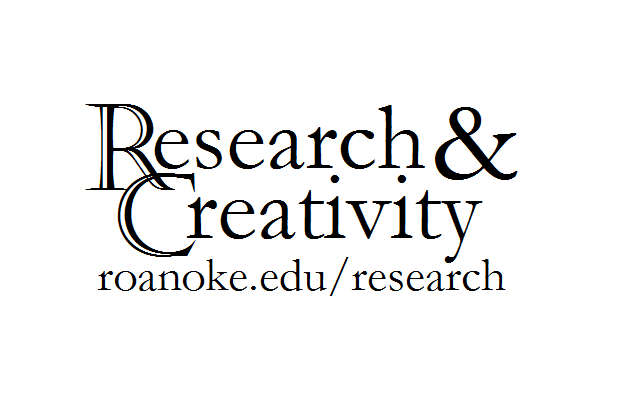 The Office of Undergraduate Research seeks to enhance student research at Roanoke College. Opportunities exist in every department.